In Review Board 2.5, we’re working on polishing up bits of the UI, while at the same time keeping a level of familiarity. We’re not going for a radically changed UI, but rather something that feels more like an evolution of what we had. So tonight, we have two small polish changes going in that we’re playing with. We’ve softened the borders, added some rounded corners, moved the dirty state indicator into the title, and added a slight drop shadow to help it pop. We also made it a bit larger by default, giving you more room to write in. Again, nothing revolutionary, but nicer to look at. When navigating through chunks of a diff, Review Board would highlight the selected chunk by surrounding it with 2px-wide black borders. While effective, this was a bit of an eye-sore. We’re trying something a bit more subtle, yet still quite visible, and cleaner. We’ll still be tweaking all this, and we’re not aiming for any new massive changes in 2.5 at this point (2.6 and 3.0 may have some more refinements/redesigns though). Our aim is to make 2.5 just feel a lot more comfortable and clean, compared to 2.0. In any business setting, it’s nice to measure as many data points as possible in order to optimize processes. One common request we’ve had over the years has been the ability to know how much time people are spending on code reviews. This can be used to identify problems on both ends of the spectrum. If people are knocking out reviews in just a few seconds, they’re probably not giving the code the attention it needs to find the defects. Likewise, if code reviews are eating up too much time, it can point to problems of accumulated technical debt or the need for training or mentoring. We’re working on a new extension that adds a “stopwatch” to the bottom-right of a review request. This can be toggled on and off, and the total time will be recorded in the review. This data is also available in the API for use by external tools, and we’ll be adding some nice reporting of this data to Power Pack. If using ACLs to limit access to parts of a Subversion tree, both the New Review Request page and the commits API would break. 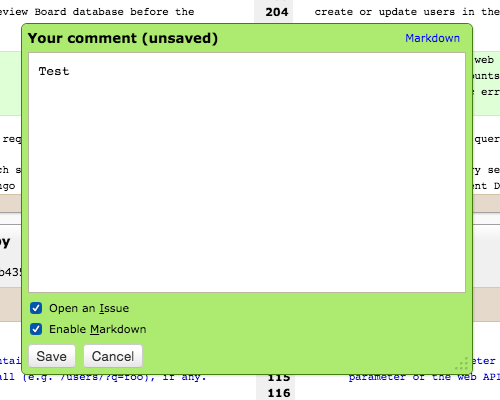 Inaccessible commits appear in the commit log, but with no data other than a revision. No date, no message, no author, and we expected at least a date to appear. So that’s fixed up now. Such commits are now shown in the commits list, though with minimal information. Ideally, we’d completely filter these out when querying for them, but that doesn’t seem doable. At least things aren’t totally broken now! We used to have a whole, internal automated build system that tested Review Board, Djblets, Django Evolution, etc. against a variety of Python and Django versions. This was responsible for automated tests, nightly builds, website doc generation, and so on. We’re getting this going again, but this time we’re using Travis-CI. To start off, we’re testing this with Djblets. The testing is minimal, but at least it’s there, and we’ll expand it as we go. Here it is. I’ve made some fixes to the extension packaging today that allow stylesheets in an extension to reference assets (images, fonts, other stylesheets) found in Review Board or Djblets. This wasn’t working before, due to some assumptions Django makes when it comes to post-processing and packaging of static files. Django allows you to define a list of static namespaces with a given name, and any static path starting with that name is looked up in that resource. So, djblets/images/<blah> or rb/fonts/<blah>. Works great in templates and everywhere else, except for static file packaging. There, the assumption appears to be that any referenced resources live in the same app. The paths built are always relative to the directory or the top of the static namespace, making it impossible to do the kind of references an extension author would want. When you upgrade Review Board, sometimes it needs to modify your database. This will happen if we’ve added new fields, or tables, or renamed a field, or deleted one, or, you know, databasey things like that. This sort of modification is a database schema migration, and they must be done carefully. They also must support all the databases we support (MySQL, PostgreSQL, SQLite). Historically, for us, this has been done by Django Evolution. Back before Django 1.7, there was no support for database schema migrations, but some clever people came to the rescue with Django Evolution. We’ve been using it since Review Board 1.0 alpha, and for the past several years, we’ve been maintaining it. It figures out what changes have already been applied (through a table that tracks those changes) and what changes still need to be applied. It then converts those evolution files into a set of mutation operations, optimizes them, and then converts them to SQL statements suitable to the database. Now, Django 1.7 finally has support for migrations, but of course the format is wildly different. For in-house projects, this is no big deal. You update the database one last time with Django Evolution, then use Django’s migrations from there on out. That doesn’t work with Review Board, though, since any user can go from any release to any release. We cannot ever upgrade our Django dependency without solving this problem. Oh yeah, and Review Board extensions are affected as well. Write a converter to convert the evolution files to Django migration files. Add a hook just before Django’s migration attempt, that imports the Django Evolution history into Django migration’s format. It would do this for any unimported apps, so we need to track those. Write some compatibility shims that convert evolution commands to matching Django migration commands, and begin a deprecation phase. Seems sorta straight-forward, right? Well, this stuff is always more complicated than it should be, so we’ll see. I’m on step 1, and so far, this is looking like it’ll work. Expect some long posts with descriptions of how gracefully I’m bashing my head into the wall shortly. Djblets now mostly works with Django 1.8! Djblets is our Django utility library full of reusable components for Review Board. It has datagrids (which powers the dashboard), the API framework, the extension framework, dynamic site configuration, and lots of other utilities. We just landed a set of changes to bring compatibility with Django 1.8! Let me tell you, going from 1.6 to 1.8 is a huge process, and retaining compatibility with both is not easy. Still, this is a big step. 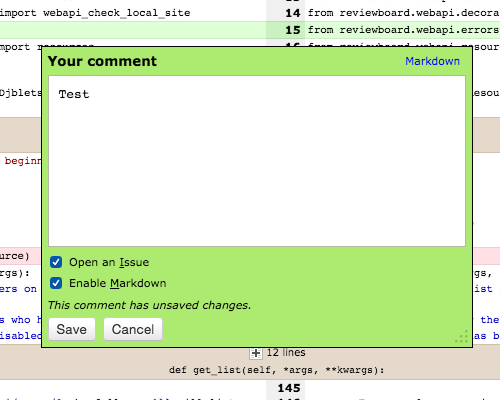 Also, this does not mean Review Board is anywhere near supporting Django 1.8. That’s a loooong ways off. Review Board 3.0 at the earliest. There’s a lot of work to do there still, and a lot of work to do in Django Evolution to convert to Django’s new migrations support. f you’ve been following our development for a while, we’ve been working on a big 2.5 release. This started off as a nice little feature release that was going to focus on API tokens, Webhooks, and a handful of other features, but has since evolved to include a UI refresh and preliminary mobile support. It’s taken longer than we’d like, surely. That happens in software, and we’re still a pretty small team with very full plates. The good news is, we’re getting pretty close to release. We’re feature-frozen, but still polishing things. We’re fixing bugs here and there (though things are looking quite stable so far). Followed by a RC release, and then the final 2.5! Awesome. So, we’re getting there. Follow us on our ChangeLog, and you’ll get to watch as we get closer and closer to the final 2.5 release. We’re back with another RBTools update, this one focusing exclusively on bug fixes. This release fixes compatibility problems with Python 2.6, a few more Unicode issues, diff generation problems on Team Foundation Server, and more. To get the latest release, head over to the RBTools Downloads page. For the full list of changes, see the release notes.